Increase your biology knowledge with this great collection of interesting biology facts. Learn about cells, DNA, ecology, natural selection, bacteria, viruses, yeast, evolution, cloning and much more. People that study biology are known as biologists. The synthetic biological cell "Synthia" is the first living organism whose parent is not a living thing but a computer. Humans share 60% of DNA with a banana. Australia’s Great Barrier Reef is the largest living structure on Earth. Reaching over 2000 kilometres (1240 miles) in length. While some bacteria can make you sick, others have positive benefits such as helping you digest food or even make yoghurt. Moulds, yeasts and mushrooms are types of fungus. The common cold is a type of virus. 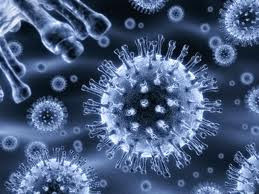 Viruses can be treated with antiviral drugs. Bacteria are extremely small and are made up of just one cell. Bacterial infections can be treated with antibiotics. Like humans, armadillos can suffer from the disease leprosy. There are also cases of transmission of this disease from an armadillo to human. Animals that eat plants as their primary food source are known as herbivores. Endangered species are those that are in danger of being completely wiped out, they include blue whales, tigers and pandas. Without protection these species may eventually become extinct. There's about 1.8m (6 ft) long DNA inside every cell nucleus in our body, and an average adult body contains around 50 trillion (million million) cells. Only 15% of the world's population can wiggle their ears! To avoid predators, a mother Slow Loris licks its offspring with poison before sending them off to search for food. The Golden "Poison Dart" frog in South America is most poisonous vertebrate in the world. Rafflesia Arnoldii is the largest flower in world, and can grow as big as an umbrella. The world's smallest flowering plant is the Wolffia, whose one full bouquet of flowers can fit on the head of a push-pin. The world's smallest frog - The Little Grass Frog - is no bigger than a house fly. With more than 80,000 arms, the Basket Starfish has the greatest number of arms. Armadillos spend about 80% of their lives asleep. The human heart has enough pressure to squirt blood up to 30 feet away. The tongue of a blue whale is bigger than a taxi cab, and can weigh as much as an elephant. There are more insects in a single square mile of fertile soil than there are people on the entire earth. The human eye blinks an average of 4,200,000 times each year. Fleas can jump 130 times higher than their own height. In human terms, that's a 6ft tall person jumping 780 ft in the air. Born on July 5th 1996, Dolly the sheep was the first mammal to be cloned from an adult cell. When the DNA of an organism changes and results in a new trait (characteristic) it is known as mutation. French chemist and microbiologist Louis Pasteur was well known for inventing a process to stop various foods and liquids making people sick. Called Pasteurization, it reduces the amount of microorganisms that could lead to disease without having a noticeable effect on taste and quality in a way which methods such as sterilization might. The Giant Kelp algea (Macrocystis pyrifera) is the fastest growing organism on earth and can grow at a rate of 70cm (two feet) a day. Charles Darwin developed the idea of natural selection, sometimes called survival of the fittest. It is a process that involves living things with favorable traits being more likely to reproduce, passing on their favorable traits to future generations.